The developers at Croteam, the studio that makes the Serious Sam games, are looking to do the unthinkable with the fourth numbered installment in the series: render 100,000 enemies on screen at the same time. Watching a hands-off demo of the game behind closed doors at E3, I was excited to see that feat in action, and for a second it looked like I might. While the titular Sam was driving around in a combine harvester, Gnaars and Kamikazes began flooding over a hill in the distance. First it was just a few dozen, but moments later it had become a horde too numerous to count. Then the screen faded to black. “We don’t want to have a cutscene and show you the battle, we want to do a single scene where you’ll be right in the middle of all that,” Ante Vrdelja, Croteam’s chief marketing officer, told Kotaku during the demo. “So far we’re getting there.” So no 100,000 unit brawls yet. The gameplay I saw was pre-alpha, and despite a devoted fan base who have been waiting for the next new Serious Sam game since 2011’s mostly well received Serious Sam 3: BFE, it’s been slow going. Released the same year as Duke Nukem Forever, BFE was seen by some as the right way to revive late 90s first-person shooter camp. 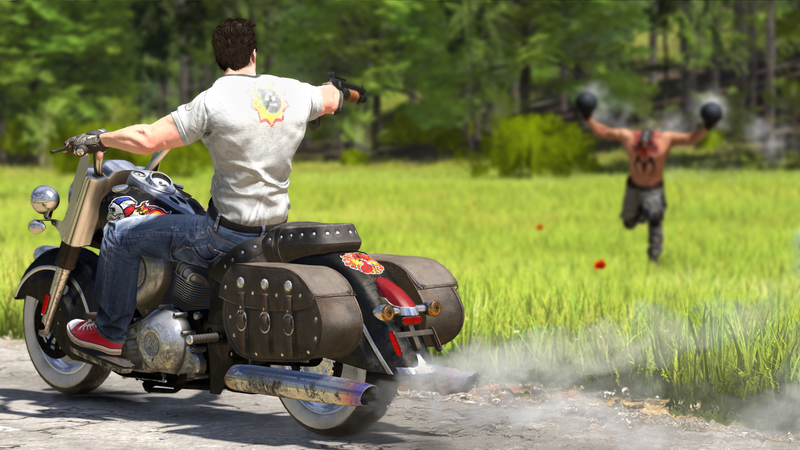 Seven years later, Vrdelja admits Serious Sam fans are getting impatient see what the series will do next. Most of the demo I saw was comprised of Sam driving a motorcycle down country roads shotgunning a mutant or two and stopping at the occasional cottage or stone tower to investigate the world and gain intel related to his mission, one I never came to fully understand. The world is incredibly open and almost sickeningly bright, with lush, leafy trees and deep azure skies overhead. The map I saw a small sliver of is apparently close to 80 miles by 80 miles and procedurally generated outside of the major plot beats and action set pieces. In order to piece together this massive space, level designer Nika Dvoravic said she and the team have been making extensive use of photogrammetry to take detailed pictures of real world objects and then recreate them in-game with relative ease. Without techniques like this, it’s unlikely the just over 40 person team at the studio, not all of whom are working on Serious Sam 4, would be able to deliver on the game’s proposed scale. The tech for rendering the population of a small city all on screen at once remains more nebulous. The large battles from the Lord of the Rings movies are one of the inspirations behind these ambitious enemy encounters, cinematic moments which remain visual benchmark in blockbuster film over a decade later. Duke Nukem with shootouts on the scale of Helm’s Deep is something even non-Serious Sam fans can get excited about. 100,000 is also a nice round number. It’s something that looks nice on the back of a box and an inspiring goal to strive for, but even if Croteam is able to deliver in the next game, it won’t be something everyone gets to experience. “This is running on a high-end PC and if you have one at home obviously you’ll get all of those units at the same time, looking great and with lots of effects,” said Vrdelja. “But we also need to scale for low-end and entry-level PCs.” Croteam isn’t yet sure what the required specs will be to get the full intended Serious Sam 4 effect, but 100,000 animated aliens running over a hill will likely only be reserved for those with the most up-to-date rigs when the game eventually comes out.